Whether you want to do some quick street shopping or just want to browse through branded maal at a showroom, Pondy Bazaar is sure to be a one stop fix for all your shopping woes. And wait, there’s more! Be it clothes, shoes, bags, jewellery, makeup, handicrafts or even home needs and quick décor fixes, Pondy Bazaar delivers on all fronts as there are shops and hawkers selling it all at this perpetually busy street. If you’re looking to do some quick street shopping, head over to the Corporation Shopping Complex as all hawkers are now moved into this complex. Inside the three-storeyed building, you can find all things budget — ranging from colourful hair clips (for as low as INR 10) to safety pins and bling earrings and even statement neckpieces starting at just INR 100. You can also find colourful printed skirts for INR 150, tracks and pajamas for INR 120, sling bags for as less as INR 150 and footwear starting at INR 100. There are only three secrets to budget shopping at Pondy Bazaar, bargaining, bargaining, and more bargaining, so make you sure you strike the best deal! Pondy Bazaar also houses a range of branded stores like Lee, Soch, Mochi, Levis, Nike, Fastrack, Wrangler and more if you’re not on a budget. But we’d rather head to our local favourites like Naidu Hall, Rathna Stores, Ramraj and Style One. Rathna Stores specialises in-home needs, right from utensils to groceries and toiletries to wall clocks and even small appliances like gas stoves and water heaters to home furniture as well and Ramraj has all things cotton like shirts, dhoti, and sarees. Naidu Hall and Krishna Tulsi are quite famous for innerwear and lingerie, so ladies, make sure you check them out. If you wish to do some saree shopping, head over to Palam Silks or Shreenivas Silks and Sarees to check out their pure silk sarees. Pondy Bazaar has a lot to offer for non-shoppers as well. You can simply take a walk down the street and you can sip on some strong filter coffee at Saravana Bhavan as you look out onto the bustling bazaar. There are many vegetarian joints that you could eat at like Adyar Anand Bhavan, Hot Chips and Geeta Veg Restaurant if you get too hungry while shopping. There’s also Anjappar Chettinad Restaurant, KFC, Madurai Pandian Mess and Ali’s BBQ & Grill for meat eaters. You can also spot many juice centres in Pondy Bazaar that will help you cool off from the ever-persistent Chennai heat. For all you men who have been dragged along to shop, check out the iconic Kerala Hairdressers at Pondy Bazaar. It is a men’s salon that started way back in 1939 and stood the test of time and commercialism. 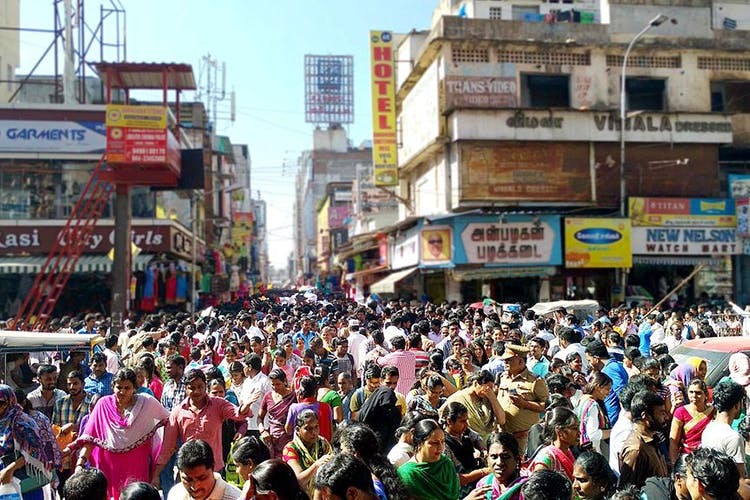 Overall, Pondy Bazaar is an integral part of the city’s shopping scene. So head out there and treat yourself to some much needed retail therapy. And more, of course! Try your best to not get there on your own means of transport as parking is a pain, and ensure you’re carrying sufficient cash in hand as many tiny stores do not accept card payments.